What is another word for denounces? 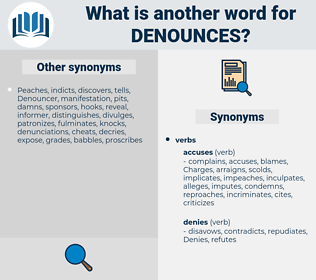 denunciations, condemnations, accusations, representations, allegations, rejects, reprimands, criticisms, advances, reports, complaints, Charges, complainants, faults, claims, deplores, convicts. 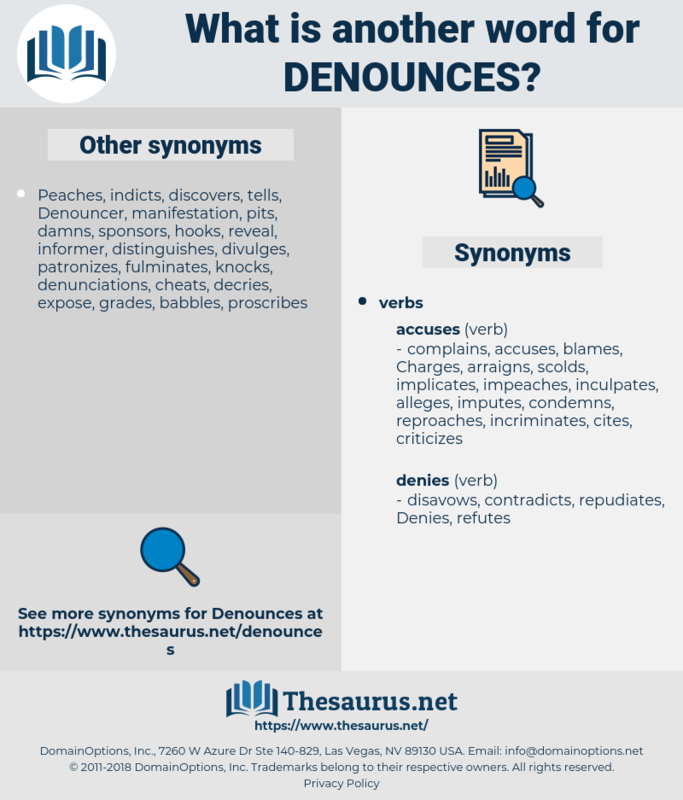 renounces, Denies, criticises, punishes, repudiates, opposes, chides, disapproves, refutes, indicts, exposes, dismiss, dismisses, refuses, rebuts, contests, rebukes, sentence, OWES, blames, invokes, betrays, consigns, ejects, disclaims, alleges, reprehends, disallows, disagrees, dislikes, challenges, highlights, penalizes, reveals, attacks, points, shows, lashes, emits, rips, throws, maintains, raps, rejects, reports, Charges, claims, convicts, slams, finds. complains, condemns, deplores, condemning, condemn. The author denounces the writings of Poza to the Catholic Church in general, and to each of its members in particular, as heretical and tainted with atheism, and also denounces all the Jesuits who defended his doctrine. Ringing letter of acceptance, in which he denounces the political power of the Northeastern Railroads, and declares that the State is governed from a gilded suite of offices in New Pork. damascus, demagogic, dinky, demonic, dance, ding, deadening, dense, danzig, dionysus, domingo, dehumanise, Den Haag, dionysius, dink, damning, dionysia, dmus, dominance, dominos, dominoes, donnish, deinonychus, deaminize, dingo, dimaggio, dimness, dengue, deadness, dingy, donkey, dominique, dinghy, dimash, de-iodinase, deimos, diatomic, dominica, doings, dunnock, dumuzi, DMZ, Dayton Ax, danish, dominic, dining, dunce, dieting, data mining, dinkey, dehumanize, dynamics, dating, dynamic, dominick, dung, doting, Dominicus, deionize, demagog, demonize, dynamize, dunk, downing, damages, dinka, damask, dank, dominus, demonise, dinge, diminish, dying, danaus, downy ash, dyeing, dowding, dong, dynamise, dawning, downy chess, dae-han-min-gook, demoniac, demise, death mask, Dayton Axe, dumas, dowdiness, demagogy, demagogue, diatonic, demeaning, downiness, danseuse, damage.